Fin Macleod left the Isle of Lewis to go to university of the mainland and never looked back. When a murder on the island is linked to an unsolved case of his in Edinburgh, Fin is sent back to Lewis to investigate. He has just lost his son and feels he has nothing keeping him in the city, although it is the final straw for his wife. The island represents his past and memories best left forgotten. The Black House was not what I was expecting. The initial crime gets a bit forgotten about as Fin goes about the island, meeting old friends and acquaintances. Much of the book is told in flashbacks to his past and I felt there weren't enough clues to link it together, except for the location and the fact that everyone seems to know everyone. Looking at it as general fiction and not a crime thriller, I enjoyed reading about life on the island, both past and present. It is starting to edge into the 21st century and the island religion is starting to lose its grip on the community. I picked up the book for the Lewis connection so I wasn't disappointed from that point of view. The story is full of traditions and little tidbits of island life. An important event in the plot, is the annual trip out to An Sgeir (Sula Sgeir) to harvest young gannets for the Lewis delicacy, guga. A group of men set out to live on this lump of rock in the North Atlantic for two weeks each year, often in hostile conditions. It is seen as a right of passage and May also includes the objections of animal rights activists in the book. I felt by the end that I'd maybe missed something as the conclusion was reached all of a sudden. The man that was murdered had plenty of enemies but there never really seems to be a suspect until the climax, which was pretty exciting at least. The present day is told in third person narrative but the flashbacks are first person from Fin's perspective. Without giving much away, I feel that Fin is rather an unreliable narrator although I wish I had time to go back and re-read some parts to make sure. 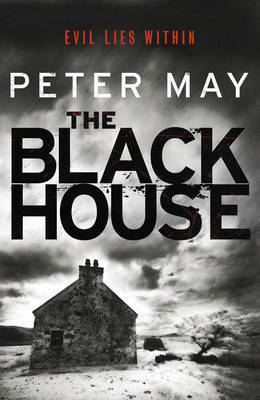 The Black House is the first in a trilogy, with The Lewis Man currently available in hardback. Now that all of Fin's ghosts are out in the open, I am looking forward to reading more in the present day. Doesn't sound like one I'd enjoy but I am really drawn to the cover. I know, I love the covers of this and The Lewis Man...and it has a really velvety feel to it! I think I would be really disappointed by this, maybe one to try if it comes along but I won't be rushing out for it.